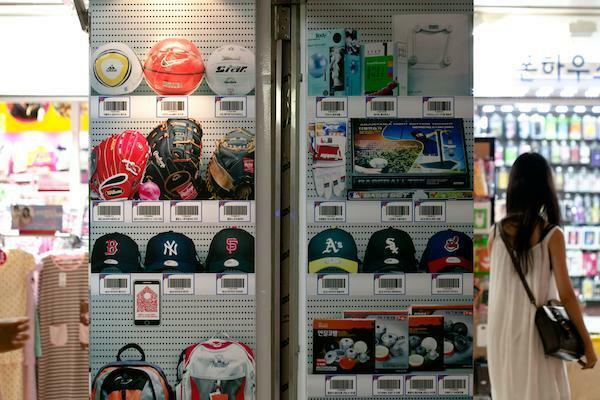 I recently heard about a new kind of "smart" store that was making its debut in Seolleung station here in Seoul. The location is nothing but a short bike ride from my flat, so I decided to roll on over and take a look for myself. 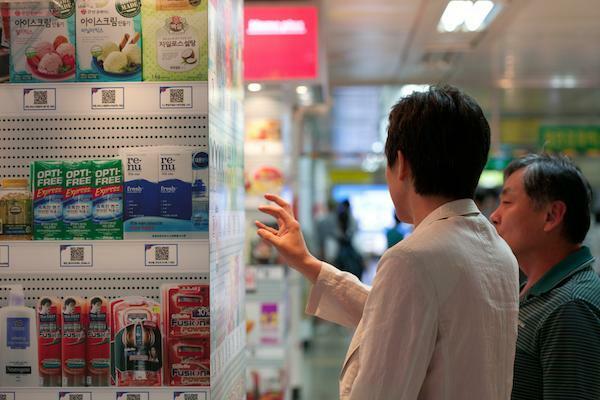 Homeplus, jointly owned by Tesco and Samsung, is the second largest retailer in South Korea. They are billing the venture as a "fourth generation" store. 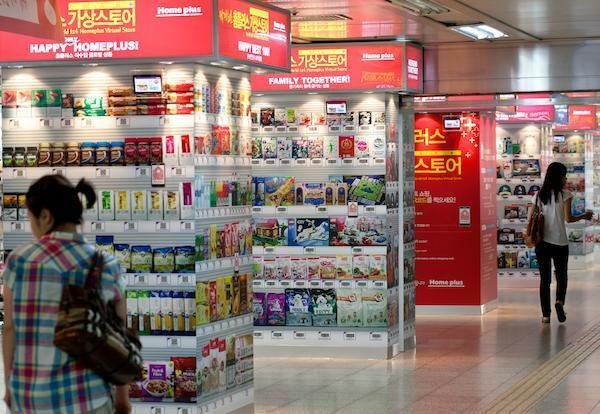 The official name is Homeplus Smart Virtual Store, and they say it is the first store of its kind in the world. 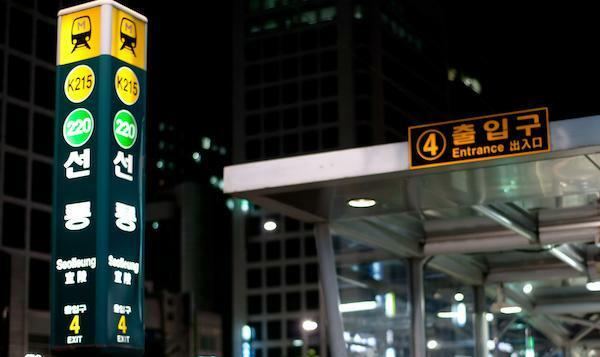 Seolleung station is in the heart of the Gangnam business district. Its a very wealthy and affluent part of town filled with tall buildings, ritzy hotels, clubs and shops. That being said, Seolleung station itself is rather unassuming. It looks much the same as any other subway station, with various venders littering the passageways between exits. I assume the reason for the placement of the virtual store in Seolleung lies in the fact that it is a transfer station, linking the inner-city green line and the yellow line that runs to the heavily populated Bundang district of Seongnam. The virtual store itself is located in one of the main corridors that runs between the exit/entry turnstiles of the green line. It might be more accurately stated that the store not just lies in the corridor, but rather is the corridor. I was expecting the store to have its own corner, much like the copious number of purse and clothing venders, but the store is actually nothing more than than the columns occupying the center of the corridor. The store itself consists of the column wallpapered with the images of various products. Each product has a corresponding QR or barcode located beneath it. The process for purchasing an item is quite simple, as outlined on the first and last pillar: First, download and install the Homeplus App for iPhone or Android. Next, using the application, scan the barcode or QR code of the intended item. Review your purchase, and then pay electronically. If you already have a Homeplus ID you'll be able to skip some of the data entry steps, but even if you lack those credentials, the process seems quite easy. Delivery is quite simple as well. The user chooses the time of the delivery, which will be made by brick and mortar Homeplus stores close to the user's address. Stores make deliveries every two hours, for a total of 10 distinct delivery times per day. Delivery fees are cheap, ranging from 1,000 won ($0.94) to 4,000 won ($3.76). 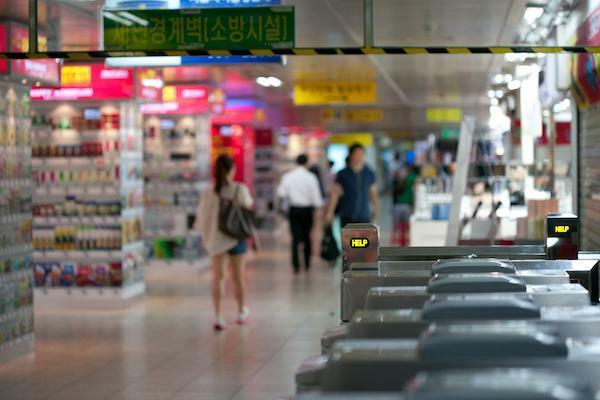 The impetus for such a store lies in the high usage of public transportation, and just as much in the high rate of smartphone usage among South Koreans. The Korea Communications Commission predicts an almost unbelievable 25 million smartphone users in the second half of 2011, as compared to 7.2 million users in the first half. For a country of less than 49 million, that is an astounding rate of adoption in very little time. The ultimate question is how popular these virtual stores will be. They occupy a vague place between at-home Internet shopping and in-store shopping. Do the benefits of shopping on the go outweigh the benefits of shopping at home? What do you think? Is this the future of shopping, or just a way for for commuters to make the most of their trip?